Based on South African playwright Athol Fugard's only novel, TSOTSI is a thrilling, provocative look at life in the ghettos outside present-day Johannesburg. Presley Chweneyagae stars as the title character, a teenager with a killer stare who lives alone in a ramshackle room in a poor shantytown, where he pulls off petty crimes with the help of three compatriots--Boston (Mothusi Magano), Butcher (Zenzo Ngqobe), and Aap (Kenneth Nkosi). But after they stab a man to death on the subway and Tsotsi (which means "thug" or "gangster") beats up Boston for trying to find out about his past, Tsotsi runs off to a wealthy section of the city, shoots a woman, and steals her car. Only later does he discover that there is a baby in the back seat--and decides to keep it for himself. As Tsotsi finally does look back at his own childhood, he tries to take care of the infant, carrying it around in a paper bag and forcing a young mother, Miriam (Terry Pheto), to breastfeed it at gunpoint. At this point, writer-director Gavin Hood could have opted for trite sentimentality, but instead he delves deeper into Tsotsi's psyche, as the young man might have already gone too far to turn back now. TSOTSI is a pulsating, electrifying film propelled by Chweneyagae's powerful, mesmerizing performance. The pounding soundtrack features popular local Kwaito music by Zola, who also plays crimelord Fela in the film. 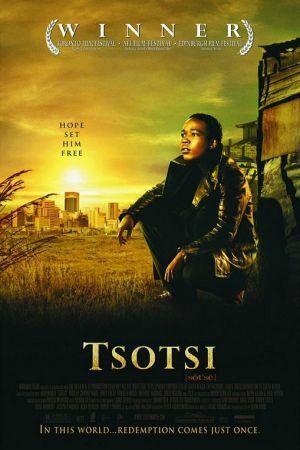 Winner of the 2006 Oscar for Best Foreign Language Film, TSOTSI "will rank as one of the best films ever to come out of South Africa," as Fugard himself said.